My favorite TV dad is Charles Ingalls of the Little House series followed by Dr. Huxtable of The Cosby Show. We watch reruns of Little House on the Prairie (weeknights on the Hallmark Channel) with our kids. Mr. Ingalls modeled self-sacrifice, integrity, and the value of hard work. He exemplified being rich in faith and joy despite being poor in wealth. He was everyone’s “Pa.” He was tough and rugged but also gentle and emotional when it came to his family. I appreciate how he was loved and respected by his children. According to Laura Ingalls Wilder, it was the preservation of her own dad’s stories that motivated her to write the Little House books that inspired the TV show. Once in a while, it is also worth it to catch old episodes of The Cosby Show (weeknights on Centric). 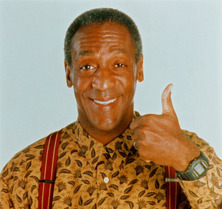 Dr. Heathcliff Huxtable, father of 5 children, emulates the fun but firm dad I wish to become. He adores his wife Claire and is not afraid to lecture his kids about good character and the realities of life. Dr. Huxtable was a cool dad. He let his kids be kids but at the same time taught them to be responsible. These two shows depict what research says is the best family environment for children: an involved father, a strong marriage, discipline, and values. This formula is pretty scarce in today’s TV lineup, especially sitcoms. There are more bad dads than good ones: Tony Soprano (The Sopranos), Walter White (Breaking Bad), Don Draper (Mad Men), Al Bundy (Married With Children), Peter Griffin (Family Guy), George Bluth Sr. (Arrested Development), Arthur Spooner (The King of Queens), Frank Barone (Everybody Loves Raymond) and Frank Constanza (Seinfeld) are some names that come to my mind. And it seems that these shows and characters are granted more airtime, critical acclaim, and loud applause from networks, the press, and their audiences. Maybe it pays to depict fathers poorly? The imbalance of bad dads seems to be increasing with every new TV season. For dads like myself who enjoy TV and quality role models for my family, there isn’t much to get excited about. But thanks to cable reruns, TV dads like Mr. Ingalls and Dr. Huxtable live on, and we can watch them all over again with our families. Which TV Dad was your favorite from back in the day? Tell us in the comments. This is a guest post from Jason Bruce. Jason is the social media specialist for the Colson Center and lives in Northern Virginia with his wife and two young children. Follow Jason on Twitter (@JasonBruce) and visit his blog The Living Rice.